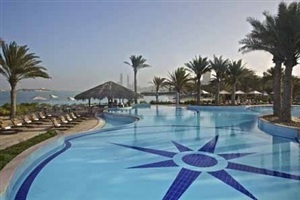 Combining the best of Abu Dhabi’s urban buzz with pure relaxation, the Hilton Abu Dhabi is centrally located on the glittering Corniche, just 10 minutes from the city centre and fringed by its own 350 metre private sandy beach with extensive watersports facilities. Inside, a confident modern style extends through the hotel’s spacious guest rooms, with Gulf or garden views, top-flight spa offering the latest and most luxurious treatments, and a superb choice of 9 restaurants and bars. 327 bright, spacious rooms decorated in rich warm tones, with great views and marble bathrooms. Guests in Executive Rooms and Suites enjoy access to the Executive Lounge. Take in the wonder of Arabia with fantastic city or sea views and find comfort in the inviting decor and plush furnishings. 28 square metres of tranquil space awaits in a Deluxe Room, accompanied by stunning views, great amenities and comfortable furnishings. This accommodation serves up ample space in the form of a working and dining area, living room, and separate bedroom. City or sea views complete the picture of luxury. Elegantly furnished, neutrally decorated and an array of lavish amenitites, combined with exclusive Lounge access and privileges, ensure an enjoyable stay. A selection of tastes from around the world with 9 restaurants and bars, including Latin American at Hemingway’s, international buffet at La Terrazza and Asian at the beachside dining at Vasco's restaurant. Savour traditional Italian dishes in an intimate setting, overlooking the Corniche beachfront. Find yourself in a secret haven where the cares and worries of everyday life can't reach you. Serving food, beverages and shisha. South American flavours are served alongside sporting events shown on the big screen and live music from the house band. Classic cocktails offered to the backdrop of live music in a relaxed atmosphere - the perfect place to chill out at the end of the day. Find internationally-inspired dishes for breakfast, lunch and dinner complemented by stunning views of the Corniche. Sophistication and splendour blend with fresh, exciting Thai flavours to create a memorable dining experience. This award-winning restaurant serves up a treat with a selection of modern and traditional Japanese dishes. Tastes and flavours inspired by the famous explorer Vasco De Gama's route around the world; gourmet dining in an equally impressive setting. Speciality coffee and teas accompanied by an array of delectable home-made snacks and cakes.